It’s a lovely day to bake a cake. That’s what I thought as I rummaged through my fridge, searching for inspiration. I had a veritable bounty of apples, and I remembered that I had read a very interesting recipe by David Lebovitz using a fair number of apples. I looked it up, and sure enough I had all the ingredients in the pantry. Which was great as it meant apple cake was definitely on the cards for supper. So I made a cake. Loved it so much that we scoffed it down before managing to take any photos of it. Of course, this meant that I had to make another one. So, for the second time in a week I baked a cake. I did have an excuse. We were taking my Grandmother out for dinner, and we needed a cake to have with tea and coffee afterwards. When Aji (my Grandmother) was eating it she said that she liked it. Which is high praise indeed. 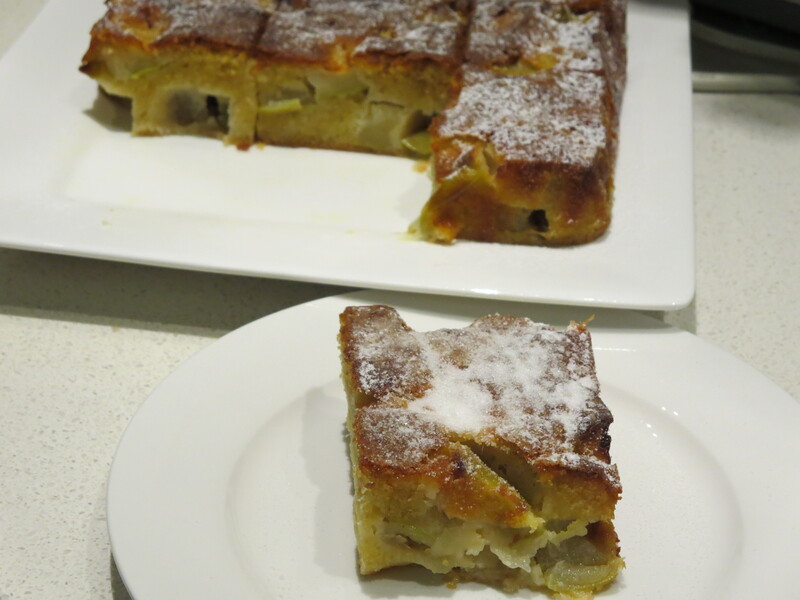 David’s French Apple Cake is wonderfully simple. There is no fussing around with creaming butter or sifting flour. It is wonderfully moist and not too sweet, which is perfect for me. I agree with his comments that this cake does not need cinnamon, and that the alcohol does add to the flavour of this cake. VARIATIONS: The original recipe states that a variety of apples is best for this dish. I only had green granny smith cooking apples, and they were wonderful. Also, I did not peel my apple (they were well washed though). Self raising flour saves you from needing to measure out a fiddly amount of baking powder. Additionally, I used wholemeal flour, as that was what I grabbed by mistake, and it worked out just fine. You could, of course, do half white and half wholemeal, or all white. The rum is important and should not be omitted, but other alcohols would be lovely to try. For example, I used a hazelnut liqueur (as I ran out of rum) although I think an apple brandy like Calvados would be sublime. Pear would make an interesting substitution, I plan to make one later in the week, I’ll let you know how it turns out. Another substitution that I plan to try is whole seedless grapes. I know that this might sound a bit odd, but I have had an olive oil based grape cake, and the batter was a very similar taste and texture, so I am fairly confident that I will work. Begin by preheating your oven to 180 °C (355 °F). If you have a fan forced oven, you may wish to drop the temperature a little. I actually cooked mine at 170 °C. Butter and line your cake tin. The original recipe only calls for buttering of the pan, but I found two problems with this. Firstly, as the apple cooks, it caramelises and can stick to your cake tin. Secondly, the batter is a slightly runny one, and can leak out of you tin. I found lining the dish eliminated both issues. Next, using a whisk, mix your flour, baking powder and salt in a small bowl just enough to combine. Melt your butter and allow to cool, so it doesn’t cook the egg when you eventually mix it all together. Now prep your apples. I didn’t peel mine, it sped up and already fast process. Cut the cheeks off the apples. Each cheek can be easily cut into 9 pieces. There will be some apple still attached to the core. Slice these off and cut them into 3 pieces each. These pictures may make this clearer. Whisk the eggs until they are foamy. This won’t take long. Add the sugar and whisk it in, followed by the rum and vanilla extract. Now whisk in half the flour, and then gently stir in half the cooled melted butter. Stir though the rest of the flour, then the remaining butter. Gently fold the apples into the mixture until the apples are coated with the batter. Pour the mixture into the prepared cake tin and bake in the oven 50 minutes to 1 hour. Mine took 55 minutes, incidentally. And that’s it. Serve with a dusting of sugar, ice cream or a dollop of cream. Preheat oven to 180 °C (355 °F). Grease and line your cake tin. In a small bowl, briefly whisk the flour, baking powder and salt. Set aside. If you have not done so, melt your butter and prep your apples. In a large bowl crack your eggs, and whisk them well by hand until they become frothy. This should take only a couple of minutes. Add in the sugar, followed by the alcohol and the vanilla extract, whisking well after each addition. Once combined, whisk in half or the flour, then stir in half of the butter. The mixture should start to look thicker and glossy. Stir in the remaining flour and then the butter. Once well combined, fold the apples into the batter. Once the apples are well coated by the batter, pour the mixture into your prepared cake tin and bake for 50 to 60 minutes, or until done – to check for doneness, insert a skewer or toothpick into the centre of the cake. It should come out clean or with a few crumbs attached. There should not be any wet batter left on the skewer. Let stand for 5 minutes before turning out. Dust with icing (powdered) sugar, if desired and serve as is or with cream or ice cream. This should keep, covered, for up to 3 days in a cool room, or 5 days in the fridge. 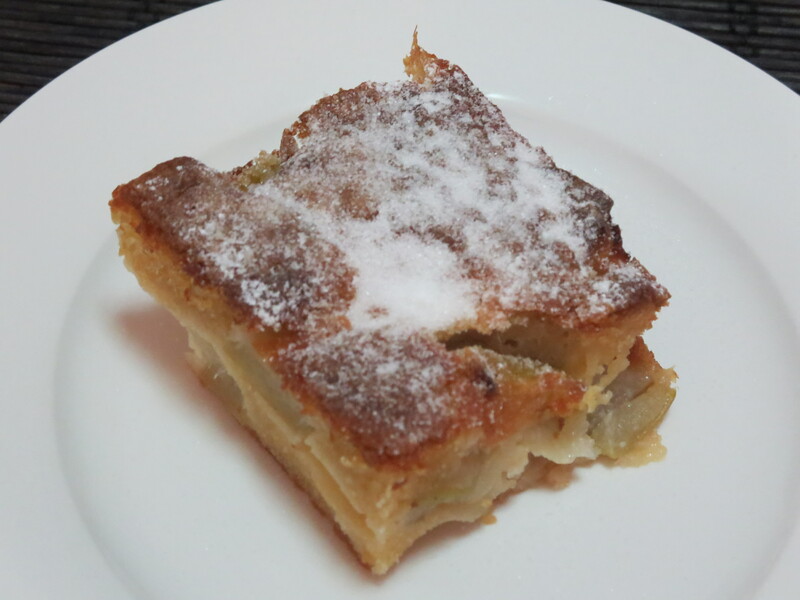 This entry was posted in Baked Goodies, Cakes, Cupcakes & Muffins, Eatables, My Family Favourites and tagged Apple Cake, Baked, Dessert, Easy, French, Vanilla. Bookmark the permalink.